Ibidem = same place, same event, same moment and same author. 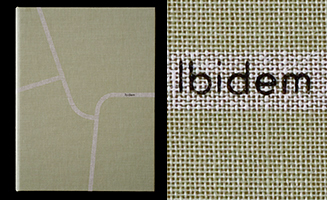 Ibidem is a project started in 2002, it is a subjective view on globalization. Ibidem is a virtual city made of ten real ones (Los Angeles, New York, London, Paris, Milan, Berlin, Singapore, Hong Kong, Shanghai and Tokyo). Ibidem is a personal diary of the transition these global cities are undergoing. WARNING : all shippings will take an average of 7 days depending on destination. For print orders, big orders or special shipping orders, please contact me directly (see my contacts page). 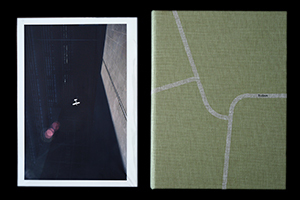 Screen printed whole linen hard cover. 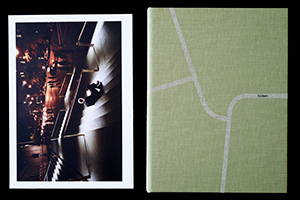 Ibidem book in a 245 x 305 mm hand made card board box with 240 x 300 mm print, edition of 15.